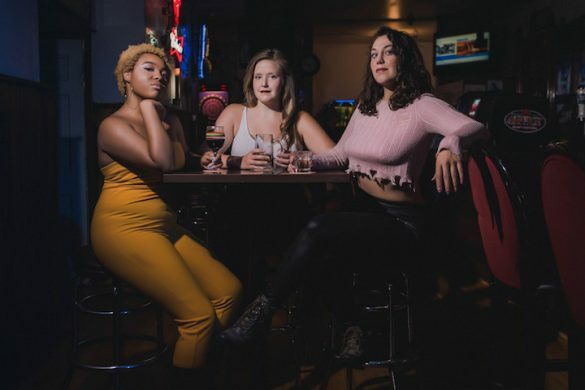 Contributor Melissa Firlit gets a belly full of laughs at Classic Stage Company’s production of The Heir Apparent. The cast of “The Heir Apparent” at Classic Stage Company (photo: Richard Termine) via The Broadway Blog. 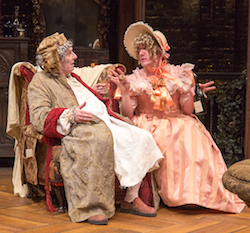 The Heir Apparent, originally written by Jean-Francois Regnard in the early 18th century and adapted by the smart and savvy David Ives, is a refreshing and boisterously funny night at the theater. Ives takes a tale that is familiar and gives it new life—one that is well appreciated by the audience, whose faces contort with laughter throughout Classic Stage Company’s production. Ives’ ability to play with language astounds with verse that has the audience laughing at the play on stage as well as themselves. This is a classic story places Geronte—a greedy, rich old uncle who is at death’s door has no heir to his fortune—at the plot’s center. Ailed with pains and coughs, he makes an arrangement to marry the young beauty Isabelle, the daughter of the strong willed and controlling Madame Arante. Isabelle is supposed to be the fiancé of Geronte’s nephew, Eraste. Madame Arante agrees to allow Eraste to win Isabelle’s hand in marriage if he can get his uncle to sign over his fortune. With the help of his two sidekicks Crispin and Lizette, Eraste tries every plot imaginable to get his uncle to name him the sole heir. Through smart theatricality, mistaken identity and classic comedic bouts, the play takes us on a hilarious journey that ends in happily ever after. 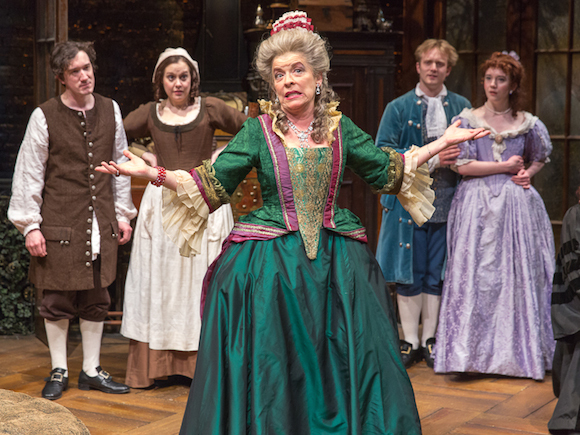 “The Heir Apparent” at Classic Stage Company (photo: Richard Termine) via The Broadway Blog. Direcotr John Rando extracts amazing work out of this terrific ensemble. The cast is sharp in their storytelling and clearly having a great time taking the audience on this romp. Crispin, played by Carson Elrod, has amazing physicality, vocal variety and comedic timing. Suzanne Bertish as Madame Argante mesmerizes us with her greed and wonderful way with words. Lizette, played by Claire Karpen, is funny, warm and keeps everyone in line with great quips and sassy authority. Amelia Pedlow plays the young ingénue Isabelle with a strong backbone that is pushed through this story because of her eager love for Eraste. Dave Quay as Eraste is smart, loving and will stop at nothing to get the fortune and the girl. The greedy miser Geronte, played by Paxton Whitehead with great ease in all of his discomforts and selfishness. Lastly, Scruples, deliciously played by David Pittu, is brilliant. Scruples is like adding ice cream to cake—it only makes it better. The design team is one of great theatrical collaboration: David C. Woolard’s costumes are loud, appropriate and completely serve the need of each character; John Lee Beatty’s set is a well-thought understatement to let the play soar; the lighting is clean and practical by Japhy Weideman; and Nevin Steinberg has designed a collection of bizarre, quirky sounds that somehow feel justified within this world. His pre-show and post-show music are pure joy to hear and capture the essence of the evening. The Heir Apparent is for anyone who is in need of a fun-filled time at the theater. It is a delightful feast for those who are hungry for laughs. Melissa Firlit is a freelance theatre director and teaching artist in the New York City area. She received her MFA from Rutgers University, Mason Gross School of the Arts.